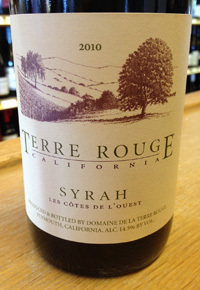 2010 Terre Rouge, Syrah “Les Cotes de L’ Ouest” California. Easton’s Terre Rouge label, a long time Rhone Ranger, still is a value priced quality wine that shows refined character and good distinction, especially the 2010 Les Cotes de L’ Ouest which is delightful and charming at under $20 bucks. Mostly from hillside plots in the Sierra Foothills the latest Terre Rouge shows blueberry, spice, mint and wild herbs leading to a medium weight palate of black cherry, boysenberry and plum fruits along with mineral, meat and pepper, with ripe tannins and a bit of fresh acidity. This wine turns soft and supple in the mouth and is an easy drinking in style Syrah, a good bistro wine, though 14.5% alcohol it feels much lighter on it’s feet and more like a Pinot Noir, it is not a flabby wine or is it very serious, it may not be all that memorable, but it is a nice and solid performer that would be a safe bet to be a crowd pleaser and it certainly would be great with lots of different cuisine from middle eastern to BBQ. Drink now, and over the next year or so, it should develop a bit more given time, but it is not going anywhere beyond where it is now overall, just pop the corks and enjoy.